I was sent HealGel Eye to try and so far so good. 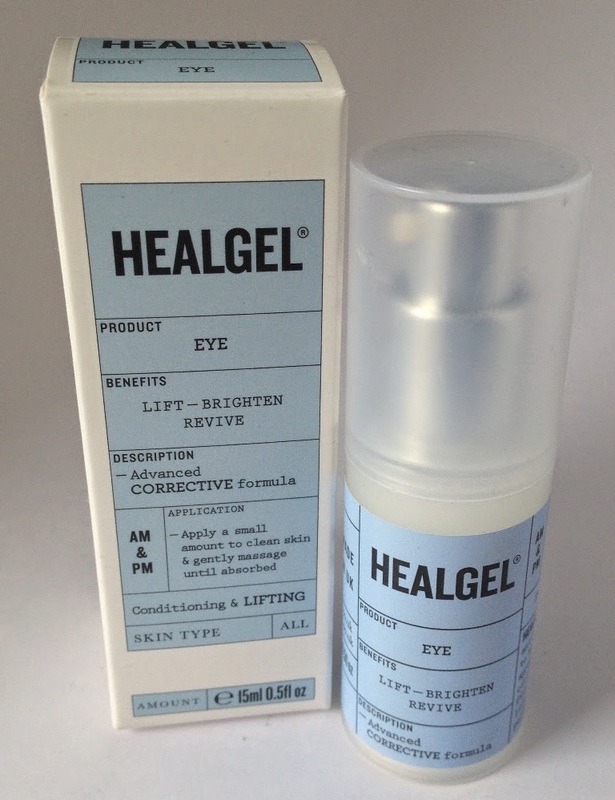 HealGel Eye is an advanced corrective formula designed to condition and lift the delicate eye area. HealGel Eye is a peerless anti-ageing formula that can help to diminish the appearance of dark circles, puffiness and fine lines. Refreshing and lightweight it provides a perfect base for make-up or a pick-me-up for tired eyes so that you can look well-rested even if you’re not. HealGel Eye contains Arnica and Madecassoside which are suspended in liposomes with powerful peptides and biodynes to initiate a uniquely soothing and collagen boosting process. Sluggish micro-circulation is stimulated and irritation is soothed. In addition, HealGel Eye contains a duel action hyaluronic acid complex that locks moisture deeper into the skin and firms the eye contours. The effect is to soften the appearance of fine lines, even skin tone and improve the elasticity of the skin through intense hydration. Light diffusers in the gel further improves sallow areas for a brightening and smoothing effect. I like the pump dispenser, it makes it so easy to pump out a rice size piece for each eye. HealGel Eye is like a serum in texture and cloudy in appearance. I apply the product twice a day. I find it cool and soothing and it instantly smooths the eye area. The area feels hydrated and rested. I like that it softens the appearance of the things I hate most about my eyes. The only thing I would mention is that if I have had a particularly bad Hay-fever day (watery, itchy eyes) when I apply in the evening it can sting a little which is not so fun. It is light and absorbs fast so you don't have to wait too long to apply makeup afterwards. It has a light lavender scent. All in all a nice pick me up for eyes.